please join me as the journey resumes on the new blog: http://theinnerjourney.wordpress.com. My dearest friends, WaheguruJi Ka Khalsa. WaheguruJi Ki Fateh. It’s been a long while since I updated my blog owing to struggles with health. I’m still building my faith in Akaal Purakh and pray that I may soon return to Chardikala and continue to share my journey. I have so much to talk about and yearn for further vichaar with which we can all come closer to our Waheguru. Life is an extremely mysterious journey and without the guidance of the True Guru (Guru Granth Sahib Ji), we remain forlorn and forsaken . . .I am no longer able to maintain this blog and beg your forgiveness for this failure. I have no other choice, but to leave it at where it has reached and hope and pray that some day, I may be able to continue it, with tireless efforts filled with the Infinite Grace of the Guru.WaheguruJi Ka Khalsa. WaheguruJi Ki Fateh. Those who lack faith may close their eyes, hypocritically pretending and faking devotion, but their false pretenses shall soon wear off. In an age where image is everything, more and more youth are beginning to define their spiritual connections, not by public display of devotion but by showcasing their alliances in the form of tattoos. While no religion specifically condones them, tattoos however, raise suspicious and sarcastic looks from those that find them undesirable, no matter how simple and clean they may seem. The Sikh youth are abandoning the Guru’s form (specifically the turban and unshorn hair) and replacing it with their own alternative – by expressing their pride through ways that find them acceptance with their peers who can longer bear the weight of conforming to their age-old tradition of wearing dastaar and unshorn hair. The turbans have swiftly lost their princely status and replaced with chic statements of tattooed arms, chests, backs and necks. Today’s generation is into the GenerationX thing – technology, luxury, image and peer-respect. It no longer matters what the Guru thinks is better – our educated youth know better and have given godly status to their outer displays of fashion statement. Tattoos have today joined the legions of body piercings, crew cuts and blings. It seems like God is in fashion these days, regardless of how aloof or ignorant we want be in trying to understand His Will, and attempting to win His attention with our artistically decorated bodies. Whether it is to show your religious alliance, to make a fashion statement or to try and interpret your version of spirituality, tattoos may not be condemned by religion, but they lead you no where. The Sikh Gurus revealed to us what Akaal Purakh had envisioned for His peoples. Over 240 years, the Sikh of Guru Nanak was groomed into the Khalsa of Guru Gobind Singh Ji. Abandoned were all rituals and meaningless aspects of life, and replaced with those that would stand the test of time and be of purpose and lead us to our Creator Lord. One may argue that while tattoos are of outer display, then so are the turbans and beards. Valid arguement, but . . . the dastaar and kesh of were marks of our affiliation to the Guru, a form blessed to the adherents of the Sikh way of life. One may adorn the Sikh turban and even maintain his kesh, and yet still pierce his body and tattoo his skin, is far more close to manmat and foolishness than those that have forsaken the Sikh roop altogether. Tattoos are nothing less than body-modification which is a process of deciding who you are and what you want to be. Tattooing and its allied arts, in other words, are increasingly understood as substitutes for more traditional religious rites of passage. Body art may be considered as an individual expression but it will never find favour with religion, no matter how much one may claim to defend it as their way of spiritual expression. Many who decorate their bodies with religious icons as tattoos claim to educate those that catch their curiosity. This is simply a sign of cultural starvation, resulting from rebelling against the norms and established way of a religious life. People claim to wear meaningful tattoos, but unless their life is dedicated to the inner self, the outer statements are as good as decorating a dead body. When we lose our intrinsic values, we attempt to guise that vacuum with alternative, self-defined ways. By ignoring the path of religious teachings and claiming to be wiser than the masters, we do nothing more than condemning ourselves into the darkness of meaningless existence. The greatest show of religious affiliation and devotion is a silent and humble one. When one sees a turbaned Sikh with a full kesh, he says more than one who has discarded the form of his Guru. While one cannot completely condemn tattoos, they can never find acceptance either. Just because religion does not condone body piercings and tattoos doesn’t mean such body-works are accepted. What God wants to see is not your self-defined image, but the one that He commissioned, through teachings of faith. In the end, the outer is to rot away anyway, whether it is adorned by the dastaar or by tattoos, but what will matter in the Court of the True Lord is how much of our being we offered to the Guru and accepted as good what they instructed us to do, not what our fickle minds thought so otherwise. A life lived without contemplation on the Word of God is far worse that exhibiting our decorated bodies that insult our divine form. Without the Naam, all occupations are useless, like decorations on a dead body. WaheguruJi Ka Khalsa. WaheguruJi Ki Fateh. My deepest, humblest and sincerest apologies to all thos who have been sending me emails and leaving feedback on my blogs for I have been completely out of touch with my blog for a very very long time now. This has been due to a number of combined reasons, much of it relating to my health as I have been unwell on and off. I have also recently quit my full-time job and started my own design consultancy which is demanding a lot of my time and resources and the full set-up is still taking a while (phone line, internet connection, email connection . . . so I’m relying heavily on cyber cafes, for now). I have also become a papa now with a son turning 4 months this week – so that too is demanding a piece of my diary. But all this is taking pace and I’ll soon be settled into a routine (you know how it is for bachelors when they have all the time to do so many other things, but once that certificate – of bacherlorhood – gets replaced by a marriage one, then the earth’s axis changes its course of rotation!). Now, coming to what’s been happening to my Sikhi-life – I’m still struggling but beginning from zero (I remember on a number of ocassions, praying to Waheguru, “to empty me of me and fill me eith Thee”, so maybe that explains why I feel down and beaten – probably like a rug pegged onto a wire and teh dust beaten out of it!). I have missed my blogs and the wonderful new family of Sikhs I have found through them and eager to touch base with everyone once more (for keeps this time, i pray) so that the Inner Journey can now truly begin – for the past was only in word, and now the time has come to put the today into deed – and of course, not without the Grace and Hukam of our Husband Lord, Waheguru. So, to all my friends of the InnerJourney – I’ll soon be back online and reply to each one of you personally and humbly beg your forgiveness for the absence in communication. Until then, may the Grace of Akaal Purakh be with you all. I do not perform Hindu worship services, nor do I offer the Muslim prayers. I have taken the One Formless Lord into my heart; I humbly worship Him there. In today’s advanced age and time, more and more people have access to education and information than ever before. This has plunged majority of them into the lofty heights of self-acknowledgement. Though this is not a new breed of people (such false preachers and self-proclaimed wise men exited since the beginning of civilization), they philosophies spread their net on people of weaker judgement and victimise them into believing their poisonous preachings. The people of Truth have always been in the minority, because I believe that is the very intention of God. If the people of Truth were in the majority, the minority would be oppressed – like the Mughals did when they spread their faith by the sword. God’s purpose to keep the men of Truth in the minority is to prove that no matter the opposition, Truth’s might triumphs – its takes time, sacrifices and faith to win over the enemy. 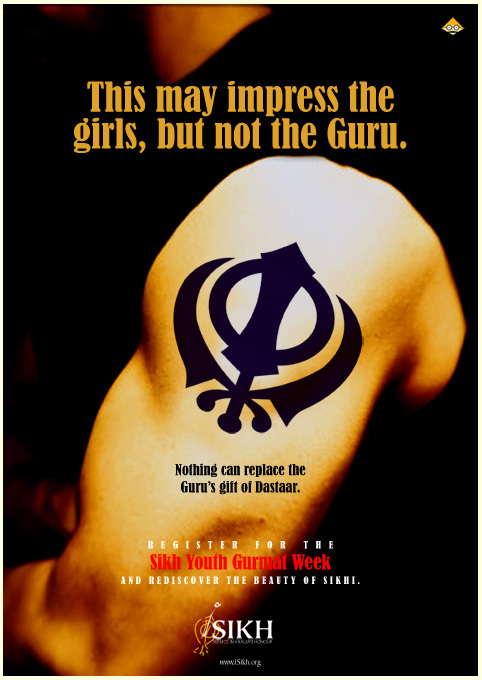 Below are posters I designed for the Sikh Youth Camp that was recently held in Makindu, Kenya. 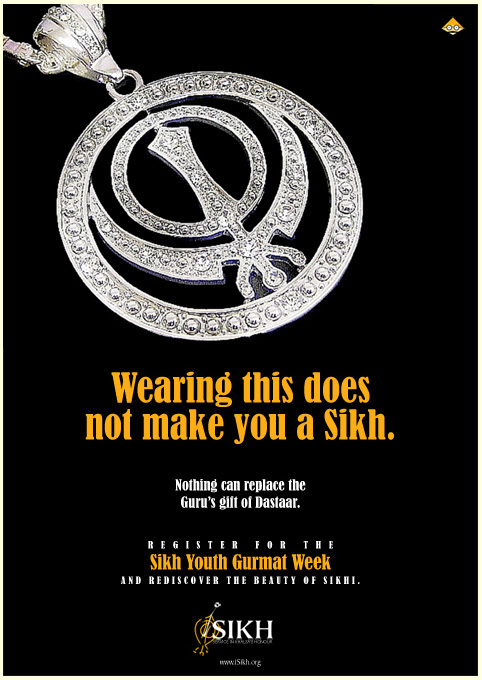 The posters were targeted at youth on what their perceptions are in contrast to what Sikh really is so that they can become more aware of the life of a GurSikh. It’s been a long while since I last posted on this blog, and even longer since I have been keeping unwell. In short, all I can say is that I have been in a state of unrest, dis-ease and constant inner battles that have defied me any understanding of what is happening to me. All this has been causing me immense anxiety, panic and depression due to which I have lost touch with many things in life. I can bare it all to my friends who read my blog, that I am no longer able to get up at Amritvela, do my paath and listen to Kirtan anymore. I know I still love to do all this, but something within has drained me away from all the things that bind me to my Guru. I no longer feel at ease due to which I feel no excitement about all the things I loved to do, and would still love to do. May be it is a spiritual message that Waheguru is trying to project (to an awakening, or enlightening) or it could all be due to the fact that I have burnt-out myself in all aspects of my life. I no longer find life that enjoyable divine gift and it is a scary thought every time I wake up in the morning. I have had friends and family tell me that I think too much and that there really is nothing wrong with me, but then I question myself further as to why then I would not be feeling better? I have cried and sobbed at the feet of my Guru but I feel little comforted, but nevertheless, I know that His Abode is the only one I seek to the last breaths of my life. Every single day has been a battle with my mind, body and soul and they are all clashing. I simply do not know what is happening to me and that is what is causing all my anxieties. Prayer and paath I can no longer do because ‘something’ keeps pulling me away from it. I fight, every single moment and I feel I’m losing the battle. I sometimes like to imagine that somehow, sometime, my Guru will come and pull me out of my darkness. Until then, I feel dejected, defeated, abandoned, lifeless. I don’t know what phase of my spiritual life my Guru is taking me through and I pray and hope to come out of it soon. If you do have a moment, please do an Ardas for your brother for I need all the Guru’s Sangat that I can get. I believe that the prayer done by Guru’s Sangat never goes unanswered. I remain the dust of the feet of the Guru’s Sikhs and humbly seek to live in the Hukam of Akaal Purakh Waheguru so that I may be granted the gift of Seva, Simran and Sangat of the Sikhs of the True Guru. Every artist has his/her interpretation of a subject and the Sikh Gurus have been painted by artists from from various religious backgrounds, no wonder the sometimes extremely strange depictions – just like the one of Guru Gobind Singh Ji below. The overly exagerated kalgi, green clothing and seating posture comes as a completely different image of the Guru that we are relatively accustomed to. Nevertheless, the painting is indeed beautiful. Because Sikh Gurus never encouraged the painting of the their portraits during their lifetime, admirers and devotees were left to put to canvas the image conjured through years of folk-lore, imagination and fond stories. That’s why almost all artists depict the Sikh Gurus differently – they painted them with what appeased their imaginations. At least through their interpretations, we get a glimpse of just how our Gurus may have looked like, though the images do not necessarily depict the exact picture – no one can actually paint the true ambiance of the Guru for that can only be done in the conscience of the true admirer and devotee. And the conscience can never be put to words or pictures, it can only be experienced by the blessed individual. The land of our Sikh Gurus is no longer what it used be since the times of the Gurus, through the centuries and into the 21st Century. In the name of modernization,the Sikh Nation is losing both their cultural and religious heritage. Gone are the days when the Punjab was known as the land of plenty – close-knit community, chardikala Gursikhs, golden wheat fields, the glowing faces of the Punjabi peasants and their sugar sweet maboli, the sound of tractors filling the soft air, and the nights of bhangra and gidda on the onset of Vaisakhi, the harvest season. The good old days seem to have gone for good, forgotten in the dark corners of our memories. Today, Punjab can no longer be recognised – gone are the gullible Sikh folk, the colourful turbans, the flowing beards, the tractors driven by hefty and strong Sikhs . . . the youth are deserting the land of their Gurus for the land of Dollars and Pounds and giving away their identity in return. Families tend to find themselves ‘entrapped’ in the land of the Five Rivers and seek to forfeit their agricultural might for settling in the cities which offers more promise. In place of the lovely folk music, television stations have opened their bars to corrupt the innocence of the simple Sikh by transmitting images and sounds of vulgar versions of their own folk music while their own claim it as their new heritage. The peoples of the Punjab have changed – amidst the few of those that still maintain their culture and religious values, the majority can hardly be recognised any longer. What was such a beautiful culture and religion has now been polluted with escalating apostasy, bipran ki reet (castes, fasting, astrology, following fake babas and gurus, inter-marriages, drug and alcohol abuse . . .) and apathy of its heritage and history. The Sikhs freed another faith from the clutches of slavery, now we have been made slaves of the very peoples our Gurus sacrificed their all to set free from tyrants. What a slow death of a beautiful and colourful heritage and the tragedy is that only a handful few care to do anything about it. With images like the one below, it’s sad to note that such aspects are getting confined to what was. But the struggle to keep our heritage alive is being fought by the awakened, but the real difference will be made by you and I. We need to teach our children and our children’s children on what the heritage was and that it should live on because it was made nor for a single era, but for centuries more to come. As for now, my heart bleeds for Punjab to see it shred from a beautiful coat of innocent folk dances, maboli, singing fields of wheat and sarson da saag, to a tattered one of apostasy, filthy television channels, vulgar music and filled with vermin that continue to nibble at the roots. O GuruJi . . .
Guru Baba Nanak travelled thousands of miles – much of them on foot. He trekked through heat, cold, rain and thunder. Spent nights under the blanket of stars and slept under trees in the thick of dark nights. With only a few clothes strapped to his shoulder, we cannot even begin to imagine how Baba went through these journeys not once, but three times over. He spent his entire life in travel, preaching the Word of Akaal Purakh. Welcomed by some, rejected by most, he nevertheless kept walking and kept meditating. Any mortal like ourselves would have collapsed under the strain of walking and mostly shelterless cold months. As I look at the painting below, I wonder, those blessed feet must be tired and sore, and yet his visage was aglow with the Divine Grace. Had I been there where Baba Nanak decides to take a breather by the roadside, I would have fallen at his feet and washed them with tears of a love he inspired. O my Nanak, had I been there, could your slave be blessed with the seva of washing your feet and soothing your sores? You have walked miles and miles on end, for me, to deliver me from this dark age and enjoin me to the Name of my Husband Lord . . . The benefactor Lord listened to the cries (of humanity) and sent Guru Nanak to this world. He washed His feet, eulogised God and got his Disciples drink the ambrosia of his feet. He preached in this darkage (kaliyug) that, saragun (Brahm) and nirgun (Parbrahm) are the same and identical. Dharma was now established on its four feet and all the four castes (through fraternal feeling) were converted into one caste (of humanity). Equating the poor with the prince, he spread the etiquette of humbly touching the feet. Inverse is the game of the beloved; he got the egotist high heads bowed to feet. Baba Nanak rescued this dark age (kaliyug) and recited ‘satinam’ mantr for one and all. Guru Nanak came to redeem the kaliyug.